The construction makes all the difference. Mastermind Björn ERNST and his team give deep insight – even into the construction of soLITE®. 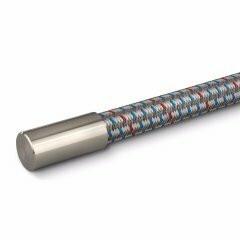 TEUFELBERGER is the only steel wire and fiber rope specialist to have developed and implemented a fiber fiber rope that features a unique, innovative and patented fiber rope based steel wire rope construction. This was made possible by a very dedicated team of wire rope and fiber rope specialists, who put their heads together and together with the crane expert LIEBHERR developed an extraordinary rope solution for lifting applications. Mastermind, Björn ERNST, and his team give deep insight of the success story of soLITE®. soLITE® will be launched into series production at bauma 2019. Therefore it seems to be just the right time to reveal a little more about the construction of this fiber rope. We designed our high performing steel wire rope construction by using the best, extremely lightweight, high strength synthetic fiber. The convincing result is the combination of the advantages of a wire rope with a high strength fiber rope. 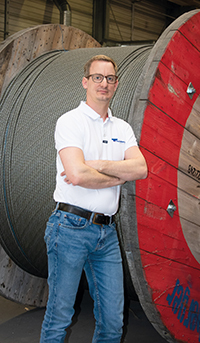 Björn ERNST, R&D Manager for soLITE® at TEUFELBERGER, shares his challenges while developing soLITE®, the reasons why he is convinced this fiber rope becomes very successful and what drives his passion for wire- and fiber ropes. The benefits of soLITE® compared to a steel wire rope are versatile. soLITE® offers an 80 % lower rope weight, hence, lighter hook block and thus 10 % greater loading capacity than steel wire rope. Crane components will not wear, and the rope does not need to be lubricated. The point of discard can easily be determined, handling is very easy and last but not least, soLITE® can reach a several times higher life time than a wire rope. The patented soLITE® construction makes the difference. “For me personally, revealing the design was an exciting step, because we naturally wanted to hold on to this edge for as long as possible. We have patented the design itself, and to the best of my knowledge, there is no other rope manufacturer worldwide apart from Teufelberger that has the machines necessary to replicate this rope. This means we are well protected, legally and physically, against imitations”, explains Björn Ernst, the mastermind behind soLITE®, evidently excited about the latest developments. 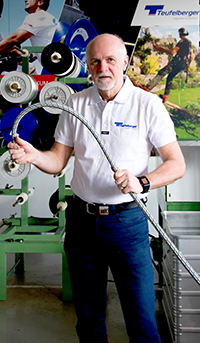 Björn ERNST, being part of the journey, right from the beginning, was supported by wire rope specialist Gunter Kaiser in 2011 and Ernst Rührnössl, the fiber rope specialist. He and his team worked tirelessly on the new project to develop the best rope possible for lifting applications. Gunter Kaiser has developed wire ropes at TEUFELBERGER since 2011. After a short time of period he became involved in soLITE® and built on his experience as a wire rope maker. So far, what has been most exciting about the project soLITE®? After many years in the development stage, it was very exciting to finally see the rope being installed on a crane, used to build a wind power plant. Right from the beginning, the feedback of the crane operators was very positive. How do you spend your time, when you are not working on soLITE? We have two little kids, which naturally leaves very little spare time. But I love to photograph which fortunately can be combined quiet well with an active family live and trips into nature. Erich Rührnössl is an old hand when it comes do the development of fiber ropes. For almost 20 years he has been working for TEUFELBERGER and helped to create the incomparable soLITE® right from the beginning. Just the fact, that soLITE® could revolutionize a market, that has been dominated by wire rope technology, excites me. Also getting to know the dimensions of a crane was new to me. It’s a very different world. How do you spend your time, when you are not working on soLITE®? I am very active with all kinds of sport, I love to work around my house, but I also like to travel around the world.